By far and away, my one top highlight for 2016 was the epic Kalalau trail one of my best friends and I hiked in Kauai. 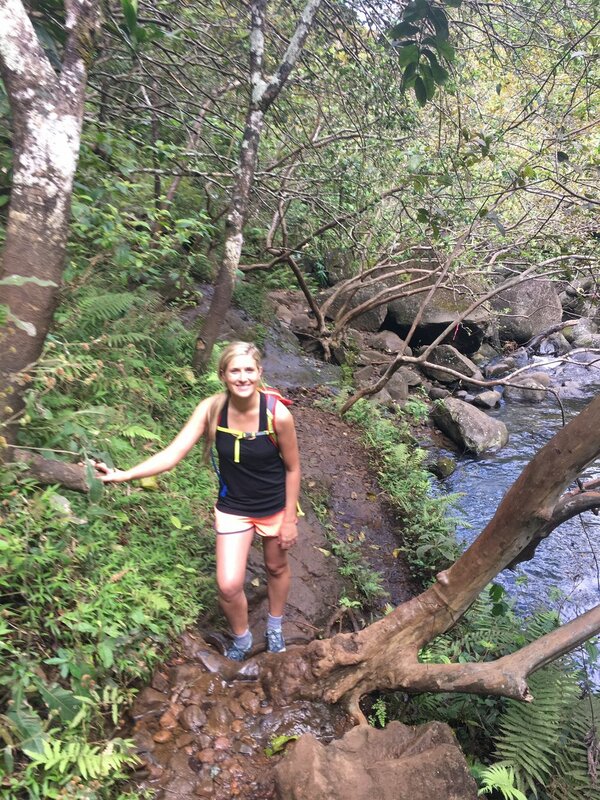 It’s the reason we chose to visit this Hawaiian island and had high hopes and expectations for the trail and views. We were not disappointed and it was one of the best experiences of my life. This hike was about the journey AND the destination, and every moment was challenging but worth it. The Kalalau trail is 11 miles each way and is deemed by many publications as one of the most dangerous hikes in the world. 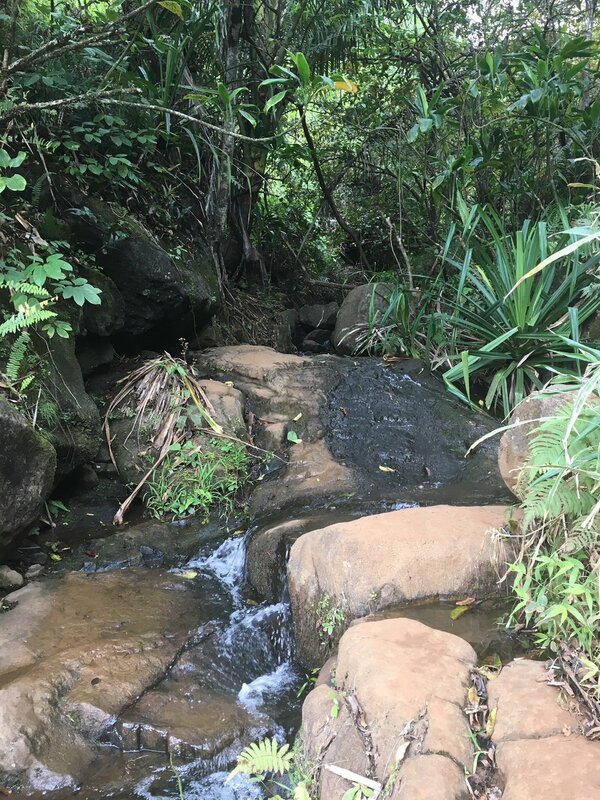 We planned on doing the Hanakapiai falls hike, which involved hiking the first two miles of the Kalalau trail, heading inland for another two miles to the 300 foot high falls, and then back for a total of a little over 8 miles. Everything we read about the trails told us we needed to be well-equipped and well-prepared. The terrain is muddy due to the climate, the total elevation gain is approximately 2000 feet, and the two miles inland crossed a stream many times. Since we arrived at the tail-end of the rainy season (March), we weren’t too worried about flash floods, but knew that it could and would absolutely rain at times. Expecting the trail to take the majority of the day, we opted to stay in a vacation rental on the North side of the island in Princeville, as it was a short drive from our condo which allowed us to hit the trail early and be home by dinner. a boy scout if you can (haha, my friend is an eagle scout and boy do i feel assured in the wilderness!). Be prepared for muddy terrain, slippery rocks, and to feel tired, sore, and thirsty even when you’re in shape and have trained for it. It is definitely a challenging trail, and not for the faint of heart. Plan on wearing comfortable clothing that you would wear on any warm-weather hike and plenty of sunscreen. One thing we found very helpful was that we decided to train regularly for the hike and went on similar landscape/length trails in our area to break in the shoes/equipment. HOWEVER, it was probably the most beautiful place I’ve ever been to- the first two miles followed the coastline with truly breathtaking views. We couldn’t get enough and were in awe of how surreal the landscape was. With the turquoise water, the red muddy trail, and the lush green jetting coastline, the colors are truly spectacular. ok, filtered. still feeling good at this point! At the trailhead, we took a quick look at the map to review what was ahead. One thing that is great is that the trail has markers all the way to the falls so you can gauge how far you have to go. The first two miles of the dirt trail involve a lot of ascending and descending, and it curves around the coastline. At some of these bends, the wind is extremely strong so be extra careful. At the end of this section, we had to cross a stream (it’s my understanding that the stream is always at least a foot deep- we were able to hop over boulders, but in the rainy season you’d have to carefully wade and beware of flash floods- basically during rainy season just avoid that altogether or turn around at this point). You’re then at the beautiful but treacherous Hanakapaii beach. There are more than enough warnings not to swim here, but it’s a nice place to stop and eat a snack before a quick bathroom break at the only restrooms on the trail and starting the hard portion inland. The following two miles are consistently challenging and require your full attention- the terrain is very muddy here and there are several stream crossings (this is where the extra socks come in handy). There's also quite a bit of rock scrambling along the trail and you need to have both hands free (hence why we don't have a ton of photos). Finally, after a LONG two miles, you arrive at the pool at the base of the falls. It’s impossible to describe the deep canyon and massive falls, but as soon as you see it, the entire hike is worth it. Eat lunch, pop in for a swim, and enjoy this site. On the way back, it felt twice as hard; we were exhausted, muddy, sweaty, sore, and thirsty. Once we got back to the trailhead, we walked to the adjacent and lovely Ke'e beach for a quick dip and nap. Overall, allow for about 6 hours out-and-back from the trailhead. Read more about the trail, as well as a great list of specific warnings and supplies (preparation will vary depending on the season you’re visiting in) here.